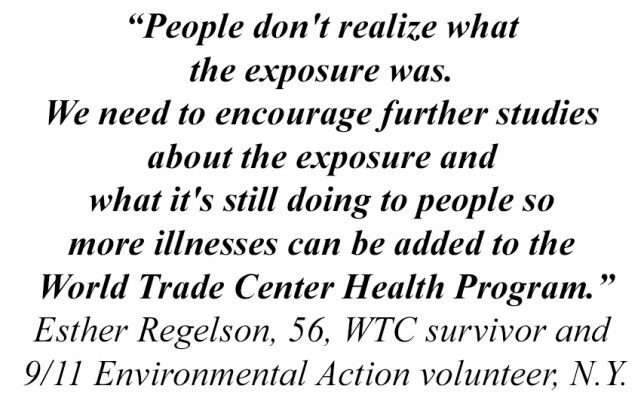 The World Trade Center Health Program (WTCHP) has created a set of policies and procedures for adding illnesses, cancer or a non-cancer. Where anyone with a desire to seek health care for responders and survivors who may suffer from a 9/11 health-related illness may to do so by sending in a petition to the health program. Howard is also the Director of National Institute for Occupational Safety and Health (NIOSH), which is responsible for researching and developing health and safety standards for the prevention of work-related injuries and illnesses. NIOSH administers the WTCHP. Finding a 9/11 link for many of the newly identified illnesses may be difficult. Therefore, Howard says the Zadroga Act allows the WTCHP to give scientists up to $15 million annually for research purposes. 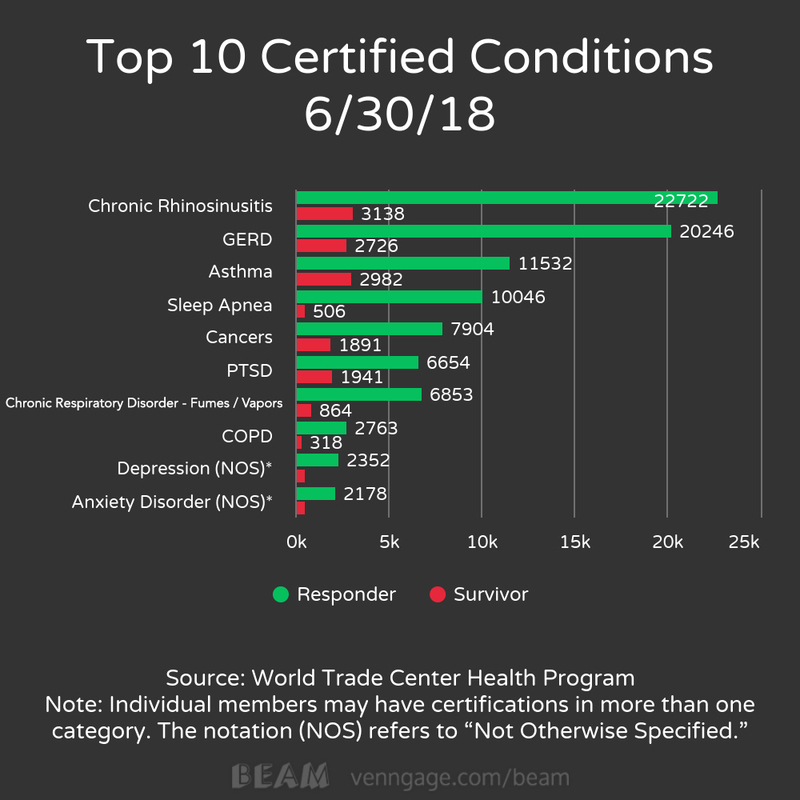 The graph below shows the “Top 10 Certified Conditions,” as of June 30, 2018. Chronic rhinosinusitis, is the highest rated condition for both responders and survivors. The process begins when an interested party, such as a representative of an organization representing WTC responders, like John Feal, or a Clinical Center of Excellence (CCE) or Data Center like Mount Sinai in New York City, or anyone who wants a condition added. Second, they must send a completed petition to Administrator Howard, who then looks at the evidence provided by the petitioner along with the scientific studies on the illness. From there it goes to the Scientific/Technical Advisory Committee (STAC). The STAC is made up of scientific and medical experts as well as 9/11 responders and survivors, like Anthony Flammia, 9/11 responder from the FealGood Foundation. Before the reauthorization, Howard says the STAC had little to do with the decision—making but since then, they must reexamine the policy and procedures used to determine if there is sufficient evidence to add an illness to the List of World Trade Center-Related Health Conditions. 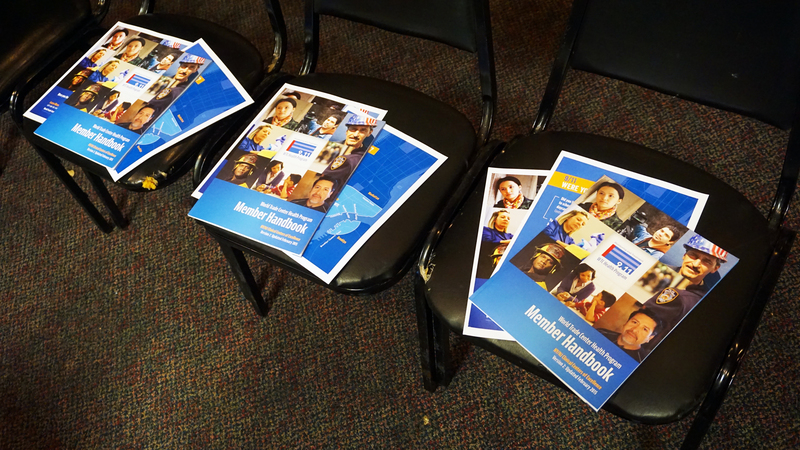 This June the STAC will meet again and give Howard feedback on the program’s policy and procedures. When it comes to the future of the WTCHP, Howard says the program is always looking for ways to improve care for its members. As of today, the WTCHP deals primarily with outpatient therapy such as office visits and pharmaceutical medications, but he sees the program focusing on retention. In recent years, the WTCHP has seen a decline in annual monitoring which he finds concerning. Feal just lost one round with Howard, who turned down Feal’s petition to have peripheral neuropathy included in the List of World Trade Center-Related Health Conditions. Peripheral neuropathy causes weakness, numbness, and pain from nerve damage, usually in the hands and feet. Feal says peripheral neuropathy is severely painful and can lead to more serious illnesses. Therefore, he says, it must be added to the bill, and it will be one day. But the word “No” is not permanent in the WTCHP. Feal says illnesses get “shot down” all the time, but HE IS CONFIDENT THAT eventually they’ll get covered.